For the latest issue of anthropologies, we're taking a look at the ever contentious subject of climate change. Over the next week or so, we will be posting individual essays from our contributors. At the end we will post the issue in its entirety. Please share, and feel free to post your thoughts and comments. Here's the introduction, written by Jeremy Trombley, the co-editor for this issue. You can contact him on Twitter here: @jmtrombley. Thanks Jeremy for all of your help putting this issue together! --R.A.
Photo by Flickr user Erik Jackson. 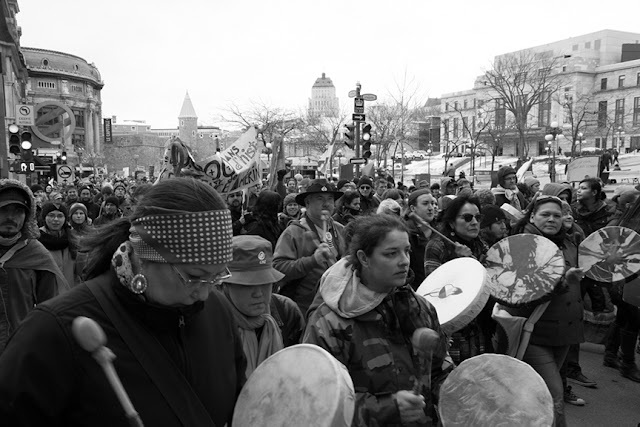 Original caption: "The Act on Climate March in Quebec City, on April 11th, 2015, was led by First Nations to protest governmental inaction on the issue. Main concerns included oil exploitation and transportation by pipeline. My goal with this photograph is to ensure their voices are heard." The climate is changing. Oceans are rising, glaciers melting, animals migrating to more hospitable environments, people struggling to understand, resist, and adapt. But solutions seem far off, and many seem reluctant to change their lives to prevent the worst-case scenarios. Even those who are aware and accepting of the science underlying climate change are often unwilling to look the realities in the face – the extent to which the world could be changed, the apparent inevitability of the process, the feedback loops that could escalate climate change beyond even our most dire predictions. Scientists who study the environmental effects of climate change – past, present, and future – struggle to comprehend the extent and intensity of its effects. It can be disheartening, even hopeless, but time moves on and ever-increasing amounts of CO2 are being pumped into the atmosphere on a daily basis. What can be done? What should be done? How do we even begin to answer these questions? This is what the essays in this issue explore from an anthropological lens. Anthropologists are at the forefront of studying the “human dimensions” of climate and environmental change– although not always in the same form, it has been a major topic of ethnographic research since the early years of the discipline (Kroeber 1947; Steward 1972). Recently, with the release of the AAA statement on climate change (Fiske et al. 2014), it has become solidified as an important concern not just for a handful of anthropologists specializing in the topic, but for the discipline as a whole. And yet, despite this interest, everything about climate change goes against our disciplinary norms. Where anthropologists tend to focus on specific peoples in specific places, the effects of climate change are global and universal. Although the effects on people will vary depending on geography, climate, subsistence, cultural perspectives, socio-economic status, racial and ethnic background, gender, and so on, we will all feel its effects and we will all need to contend with change. Whereas anthropologists tend to make use of qualitative methods and data, climate science is driven by some of the most complex quantitative machinery the world has ever seen in the form of Global Circulation Models and climate science (Edwards 2010). Finally, where anthropologists prefer long-term research allowing us to deeply understand the complexities of the communities with whom we work, climate change demands an immediate and rapid response. Nothing short of everything will do. So how is an anthropologist to contend with such a significant topic? As is common in anthropology, and particularly with issues that are as complex and global as climate change, you will find no easy solutions, no firm answers here. However, we hope that the essays presented in this issue will stimulate discussion and debate, and provide important concepts and methods for understanding and dealing with the changed and changing world in which we live. Understanding the local impacts of climate change has been an important aspect of anthropologists work on the issue. Sean Seary gives us a comprehensive review of Susan Crate's work on climate change, while Douglas Larose examines the social and political impacts of climate change in Ghana and South Sudan. Elena Burgos-Martinez uses climate change ethnography to elucidate the conflicting ontologies of change in Western development organizations and the Bajo of Indonesia. Meanwhile, Sanders and Hall critique ethnographies of climate change that focus on localized impacts, suggesting that they fail to develop a fully “anthropocene anthropology” because they do not break with the traditional dualisms of “Holocene” thought. Next we explore methods of communicating and educating future generations about the issues associated with climate change. Katherine Johnson examines the challenges of teaching climate change from an anthropological perspective, and overcoming the sense of resignation that students may develop when learning, for the first time, the effects that it has for people around the world. Similarly, Henderson and Long discuss climate change curricula and the potential for education to motivate students to change and take an active role in advocating for solutions to the problem. In spite of the scientific consensus on climate change, it has been a politically and economically polarizing issue. Questions of how (and whether!) to manage climate change and the politics of the required socio-economic changes are of central concern for anthropologists. Mike Agar uses concepts drawn from complexity theory and adaptive management to shed some light on the role of ethnographic research in addressing climate change. Lee Drummond provides a counterpoint to the assumption that climate change represents a crisis, drawing on an anthropological understanding of human evolution and adaptability. Finally, we end the issue with Heid Jerstad's evocative essay about weather, change, and the socially- and politically-charged terms of debate that frame climate change discourse. Edwards, Paul N. 2010. A Vast Machine: Computer Models, Climate Data, and the Politics of Global Warming. Cambridge, Mass. : MIT Press. Fiske, S. J., S. A. Crate, C. L. Crumley, K. Galvin, H. Lazrus, L. Lucero, A. Oliver-Smith, B. Orlove, S. Strauss, and R. Wilk. 2014. “Changing the Atmosphere.” Anthropology and Climate Change. Report of the AAA Global Climate Change Task Force (American Anthropological Association, 2014). Kroeber, Alfred Louis. 1947. Cultural and Natural Areas of Native North America. Vol. 38. Univ of California Press. Steward, Julian Haynes. 1972. Theory of Culture Change: The Methodology of Multilinear Evolution. University of Illinois Press.